Budapest, Keleti Station, Friday night, September 4th 2015. Just after midnight. Public transit buses arrive, sent by Hungary‘s government to take the refugees who have been camping there for around a week to the Hungarian-Austrian border. Wary that this might be another of the government‘s underhanded tricks, many refugees are initially reluctant and decide to wait. But after a while they begin to board the buses and continue their journey towards the next border. After days of waiting they are on the move again, and after days of searing heat, as if the weather, too, wanted to draw a line under this week of struggles, a soft rain sets in. In the course of the night and the following day, more than 10.000 refugees cross the Austrian border. Austria and Germany had agreed to let them enter. Many others set out to follow. In this article we recapitulate what has taken place in Hungary and Europe over the last week in order to assess the significance of these events for the future of the European migration and border regime. Since Greece‘s effective withdrawal from the Dublin system in 2011, Hungary has been the southernmost Schengen and Dublin state in Southeast Europe – and continues to be, as Romania‘s and Bulgaria‘s accession to the Schengen zone is continually delayed. The currently established route refugees take on their way from Turkey to the north of the EU leads through the non-EU states of Macedonia and Serbia. At least on paper, although this is not without legal controversy, Hungary is therefore officially responsible for conducting most of the asylum procedures concerning those refugees traveling across the Balkans. A remarkable number of refugees who spoke to us reported ill-treatment by Hungarian police directly after crossing the border from Serbia: After crossing the border, refugees – including women with small babies – are routinely detained for several days, officially for „registration“ purposes. But even recognised refugees are regularly affected by homelessness and unemployment in Hungary. The generally poor economic situation in Hungary, which was hit hard by the financial crisis of 2008, also affects refugees. Add to this the nationalist and openly racist orientation of the Hungarian government under Victor Orbán. Only recently the government publicly displayed its aversion to refugees on posters: „If you come to Hungary, you mustn‘t take work from Hungarians“, one of the slogans read. In June 2015 the Hungarian government took an aggressive step forward: it publicly announced that for „technical reasons“ no more returns according to the Dublin agreement would be accepted. This announcement had to be revoked the very next day due to considerable pressure, notably from Austria. It seems to have served to exercise pressure prior to the EU summit of June 25th/26th, on which occasion asylum and immigration policies were on the agenda as well as proposals to supplement the Dublin Convention with a voluntary quota system. At this time, Hungarian construction work on a 175 km fence along the border with Serbia had already been annonced and was met with massive criticism within the EU. After arrivals to Greece had been rising sharply since spring 2015 and more and more refugees set out on the Balkan route towards the north, increasing numbers of refugees began to arrive in Hungary. In July 2015 „only“ 1.000 to 1.500 persons were intercepted at the Serbian border on any given day. These numbers have steadily increased and have temporarily reached a staggering 3.000. Per day, that is. The Hungarian government‘s original plan – to detain as many refugees as possible for an extended period of time in hopes of generating a deterrent effect – was rendered obsolete. Hungary simply lacked the capacity to detain tens of thousands for longer periods; the refugees were set free after a few days and traveled on to Budapest. Budapest‘s two major train stations, Keleti and Nyugati, had already developed into a hub for organising the onward journey to northern Europe since the beginning of 2015. As a general rule, this involved the help of smugglers offering transport by car to Austria and beyond. According to our sources the cost was around 200 Euros per person. Due to the sufficient availability of this relatively cheap offer, only a few dozen or sometimes a few hundred refugees were present at Budapest‘s two stations at any given time, but never more. The informally organised onward travel worked quite smoothly. This assessment of the situation is further substantiated by the fact that hundreds of „drivers“ are currently detained in Bavarian and Austrian prisons, where they await trial for alleged „human smuggling“. On Tuesday, August 25th, the German Federal Office for Migration and Refugees (Bundesamt für Migration und Flüchtlinge – BAMF) reported that Germany would suspend Dublin returns of Syrian refugees until further notice. It later transpired that this was only an internal guideline which was neither legally binding nor uncontroversial within the BAMF. Nevertheless the news spread very quickly among the Syrian refugees. All attempts by the German government to relativise the measure were too late: Germany became the number one destination country for refugees in Europe. On Thursday, August 27th, the Austrian police discovered 71 corpses of refugees in a lorry parked at a motorway car park south of Vienna. Following the discovery, Austrian police intensified the search for human smugglers. By Monday, August 31st, this had led to massive police control on the motorways leading from Hungary to Austria, leading to traffic jams up to 50 km in length. Understandably, the smugglers largely discontinued their activities. At the same time Hungarian police prevented refugees from boarding international trains. Only then did the informal camp at Keleti station grow to several thousands. On Monday, August 31st, the rumour spread that Germany would collect the refugees that were stranded in Hungary using chartered trains while Hungarian police withdrew from the station completely. A run on the trains (#trainofhope) set in. In the course of the day, several thousands of refugees were able to leave Hungary to arrive in Vienna a few hours later and soon afterwards in Munich. Austria did nothing to stop the refugees. Refugees waiting at Viennese stations to continue their journey weren‘t stopped either. It can be assumed that Germany and Austria had by now begun to exercise immense pressure on Hungary behind the scenes. Austria‘s Chancellor Feynmann publicly urged Hungary to perform its duties. As a result, Hungarian police closed the Budapest station to refugees. At the time, at least 3.000 refugees were still at the station and more kept coming. This situation continued until Thursday, September 3rd. On this day all international train connections were suspended. However the refugees were informed that they could take regional trains to the Austrian border. The first train containing around 600 refugees was stopped 35 km outside Budapest at a town named Bicske and surrounded by police. The police wanted to transport the occupants of the train to a refugee camp located there. The occupants of the train resisted and remained on the train for around 30 hours. At the same time news of the trick spread and no more refugees boarded trains. 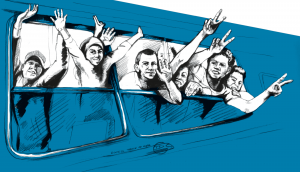 On Friday, September 4th this struggle for freedom of movement reached its current culmination. As announced the previous day, several thousands of refugees set of in the early afternoon to make their way to the Hungarian-Austrian border – 170 km from Budapest – on foot. Their declared destination: Austria and Germany. In Bicske, around 300 of the refugees that had been detained there set of on foot and walked west along the rails. Earlier that day, 300 further refugees who had been interned in Röszke near the Hungarian-Serbian border had overcome the fence around the camp, only to be stopped by police later on. In the afternoon, the refugees remaining in Keleti station were attacked by Hungarian hooligans, but were able to stave off the attack. The march towards the west, which quickly became known under the hashtag #marchofhope, progressed relatively swiftly and soon reached a two-lane motorway. 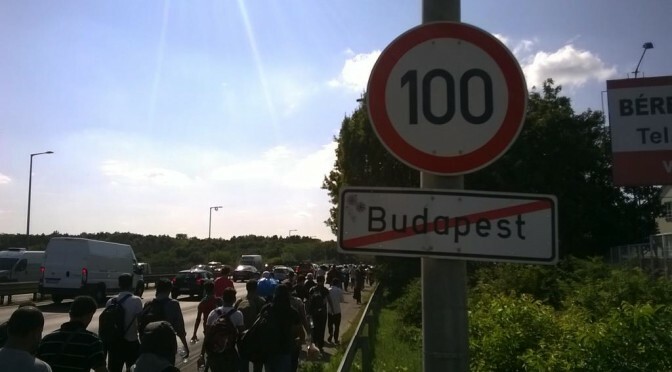 The images of this march will surely find their place in the iconography of this long summer of migrations: a long line of people who, after a week of waiting, reappropriated their own mobility and collectively left Budapest. Under the impression of these images and the knowledge that a repressive strategy had failed, Germany and Austria announced that they would open their borders and receive the refugees, whereupon the Hungarian government organised the bus transport to the border. Over the course of the weekend, at least ten thousand refugees reached Germany. The borders were finally open. It is important to us to note that the above episode from the long summer of migrations underlines how permeable the border regime already was, but that only the disruptions of mobility drew attention to the fact. After the Turkish-Greek border had effectively been open for months, many people had already made their way to the north in the past months. Greece limited itself to ensuring the onward transport of refugees from the Aegean islands to the Macedonian border. Macedonia and Serbia allowed the transit of refugees, and even in Hungary, the activities against the informal logisticians of escape who organised onward travel to Germany were not overly decisive. It was as if the trnsit countries had made an unspoken pact: move along, there‘s nothing to see here. The first disruption set in when Macedonia attempted – briefly and unsuccessfully – to close the border to Greece. This led to a stoppage which became manifest several days later in the shape of increased arrivals in Hungary. Surely the announcement that the construction of the Hungarian fence would soon be completed contributed to the fact that increasing numbers of refugees attempted to cross the border before it was too late. But only the effective blockade of the Hungarian-Austrian border allowed the situation in Hungary to escalate in such a way as to necessitate the temporary but complete suspension of the border regime within. Generally speaking, and we are not the only ones who see it this way, the Summer of Migration (aka „European Refugee Crisis“) is perceived as a crisis of the European project. Alas, this insight is expressed less as a fundamental critique of the Schengen border regime and the Dublin Convention than as an appeal to EU member states to finally show solidarity and find a common European solution: an appeal that is forgetful of history, pretending as it does that nimbyism („not-in-my-back-yard-ism“) and the idea that „might makes right“ didn‘t enter European migration policy until 2015. The most curious aspect is probably the Hungarian government‘s complete and utter inability to turn a humanitarian catastrophe in the centre of the capital to its own advantage. Instead of demanding concessions from Europe, citing Hungary‘s own geographical location, finite resources and the necessity to protect human life, Victor Orbán ranted through Europe and let his racism and chauvinism run free. Paradoxically, Hungary is now being pilloried for its callous attempts at maintaining the rules of the European border and migration regime, while Germany, regardless of its role as architect and driving force of that very regime, wins worldwide acclaim for its humanitarian stance. Without a doubt, the most beautiful aspect is the fact that along with the refugees from Syria, the original power and hope of the Arab Spring has come to Europe for the second time and challenged its boundaries. The rhythm and determination of the slogans that were chanted, for days on end, against the police barrier at the main entrance to Budapest‘s train station, seemed strangely familiar. And we don‘t read the image of the one-legged man leading the march to Austria with a photograph of Angela Merkel around his neck as an image of self-victimisation. On the contrary: this image is an expression of incredible determination to reach a goal, even on foot and with only one leg. Lately this determination has met with more and more supporters all over Europe, supporters who organise help beyond the state using Facebook and Twitter, right up to the call for collective and open human smuggling. On Sunday, September 6th, 140 cars from Vienna actually followed this call, undisturbed by police. In view of the many refugees who still remain – or are only just arriving – in Greece, it is to be expected that the situation will continue like this for the next weeks and even months. The borders are open, the border regime is on the defensive. But the strategists in Brussels and Berlin are working on their next moves, that much is clear. A EU-wide list of so-called „safe countries of origin“, large-scale internment camps at the EU borders (or more precisely: within these borders, for even the dream of externalisation seems to have been put on the back burner for the time being), a pressure relief valve for Dublin and altogether more mighty and centralised European institutions of asylum and border protection. The European border regime will look different after this summer. But what remains is the message that it can be overcome. And this, too, will surely soon repeat itself.